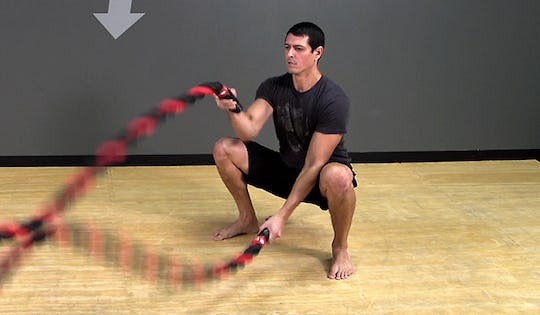 The Battle Rope Alternating Wave Squat takes the basic alternating wave and the bodyweight squat to a new level by combining them to challenge timing, balance and conditioning. This drill is best used for short bursts of high intensity activity followed by active recovery. Step 1: Stand up straight holding the end of the battle rope with an approximate 2 foot walk-in. Step 2: Stand up straight holding the end of the battle rope with an approximate 2 foot walk-in. Step 3: Keeping your back straight and core tight, sit back and down into a squat. Step 4: Stay focused on maintaining consistent waves and upright posture as you stand and repeat. Tips & Safety: Make sure to find the appropriate walk-in distance to help assure the waves travel efficiently. Too short a walk-in will be easy but will not allow for real undulation…too far a walk-in will make this drill very difficult.